If you choose to roll out your swag in The Ashburton, you’ll never look back. 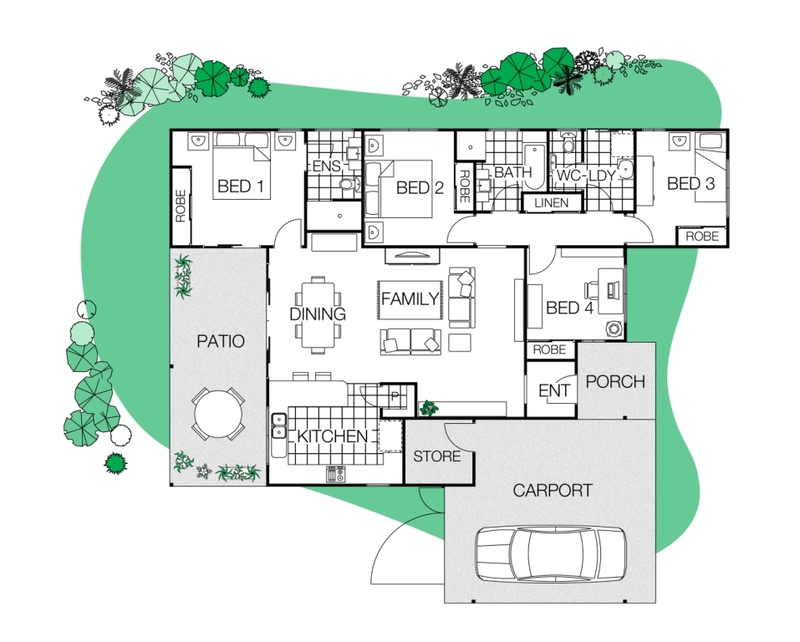 Just as the Ashburton River is a life force to inhabitants of Western Australia’s arid Pilbara, The Ashburton home design will sustain your growing family for many years. It is packed with style, flexibility and surprise. Surprise, because you can’t help but ask, “How can 4 bedrooms, 2 bathrooms, a kitchen, dining and family room possibly fit into 129sqm of floor area without compromising on space?” The answer = clever architecture. And the price will surprise you too! You get a lot of riverbed space for your money. Enter via the porch, then hang up your hat in the feature entryway before you let the current take you into the ‘mouth’ of the home – the open plan family/dining area and kitchen. Here you can share meals, stories and fun times – even the chef in action can join in, with the kitchen a tributary off the main hub. The Master Bedroom, with its double robe and ensuite, is thoughtfully separated from the other 3 bedrooms, which flow off their own stretch of river. The fourth bedroom can be a study, kids’ playroom or creative studio until it needs to be freed up for new “guppies”. With an impressive 28sqm of patio and porch area, you’ll be swimming in outdoor space at The Ashburton. As you cast a line from the porch or recline in your hammock with a good book, the kids can ride the rapids out on the back patio. There’s enough space for everyone to breathe.